Sara Couden | The Chamber Music Society of Lincoln Center. 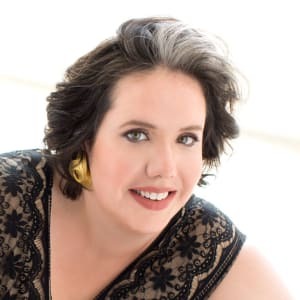 Praised by Opera News for her “unusually rich and resonant” voice, contralto Sara Couden has already established herself as a premiere interpreter of operatic, chamber, and song repertoire. Highlights of her 2018-19 season include a return to the Metropolitan Opera to cover Marta and Pantalis (Mefistofele), Dejainira (Hercules) and Irene (Theadora) at the Staunton Music Festival, Testo in Stradella’s La Susanna with Heartbeat Opera and Opera Lafayette, Israelitish Man (Judas Maccabaeus) with Philharmonia Baroque, Sir Karl Jenkins’s Stabat Mater with Distinguished Concert Artists International at Carnegie Hall, Bach’s St. Matthew Passion with True Concord Voices, and a third summer at the Marlboro Music Festival. In previous seasons, she toured Japan with Maestro Masaaki Suzuki in Bach’s B minor Mass and covered Erste Magd (Elektra) at the Metropolitan Opera. She has also appeared as Third Lady (Die Zauberflöte) with the Los Angeles Philharmonic, Dryade (Ariadne auf Naxos) with West Edge Opera, and the Alto Soloist in Mahler’s Second Symphony with the Santa Cruz Symphony. She recently completed the Lindemann Young Artist Program at the Metropolitan Opera and made her Metropolitan Opera debut as Albine (Thaïs) in 2017. She has been a fellow at the Marlboro Music Festival, Music@Menlo, Music Academy of the West, and the Institute for Young Dramatic Voices, and holds a Master’s of Music with Honors in Opera from the San Francisco Conservatory of Music and an AD in Early Music, Chamber Music and Oratorio from Yale University.